Our intention sets us on an ever-changing path. The future is in constant flux adapting to the decisions, choices, and activities of all elements in the system. When we use our imagination to set up a vision for ourselves on time horizons well beyond now, we set our intention in motion. Asking ourselves, “What would we do if …?” where we add those potential situations where we are not constrained by resources allows us to imagine our future that we want to create. This intention may be used to develop objectives, goals and targets that support manifesting our vision. It’s important to expand our time horizons to the greatest extent possible in our lives as it shifts our spatial boundaries as well. Our perspectives shift when we think about the consequences of our actions over years and decades. To do so, we have to step back and see the larger limits of ourselves, others and the environmental factors affecting our ability to bring about our vision. This expanding the boundaries of our thinking and awareness serve to better situate ourselves in the given moment. When things happen we didn’t plan for, we can seize opportunities by orienting ourselves and actions to do good not only for our own selves but for others as well. Asking ourselves, “What needs to be done now?” is critical. When we think about what needs to be accomplished, we focus our attention on the needs of the situation, our activities and our vision. This regular re-focusing of our attention empowers us to do just about anything we set out to do. This is looking after our future selves. It is managing the situation to keep ourselves on a path that reaches our destination. It is becoming a steward of our future selves. When we ask ourselves what to do now, it is important to take into account no only our own desires and needs, but those of others and the environment. In doing so, we help integrate our activities with the happenings occurring around us which creates positive feedback for our own purposes as well as others. 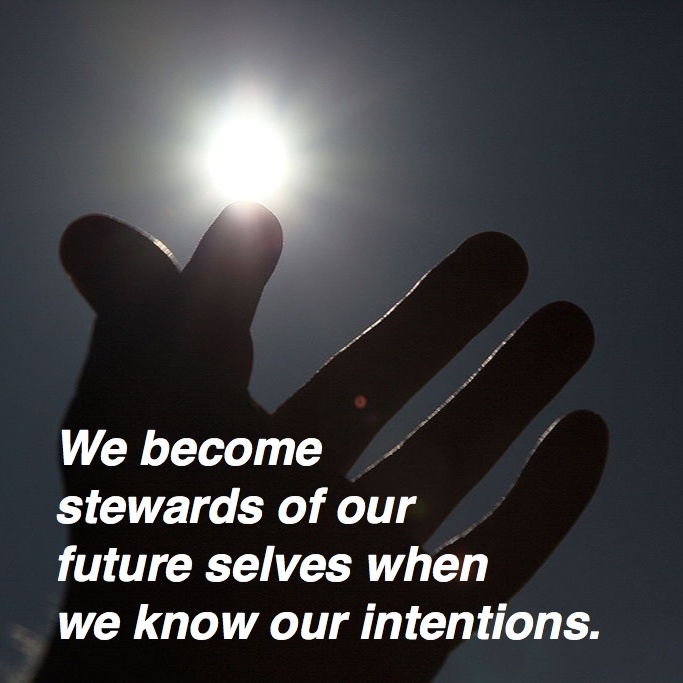 In doing so, we become stewards of our future selves when we know our intentions. It is important to be reminded of the need to expand our foresight out to the greatest extent possible. It is easy to create intentions for where you would like to be in one year, or two. The real opportunities come in visioning how you plan to play with your great grandchildren. Yeah, It’s just so easy to get stuck in our day-to-day stuff and lose sight of the important things. That’s the underlying theme of this entire blog couched in the analogy of minding our business. Thanks for the comment. I appreciate it.